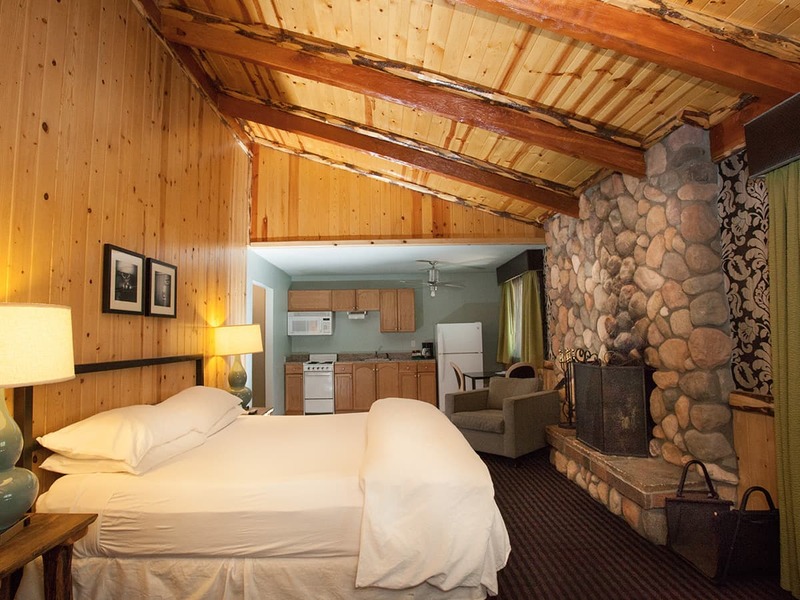 If you're looking for spacious cabin style South Lake Tahoe lodging then the 3 Peaks Resort & Beach Club is the place for you. 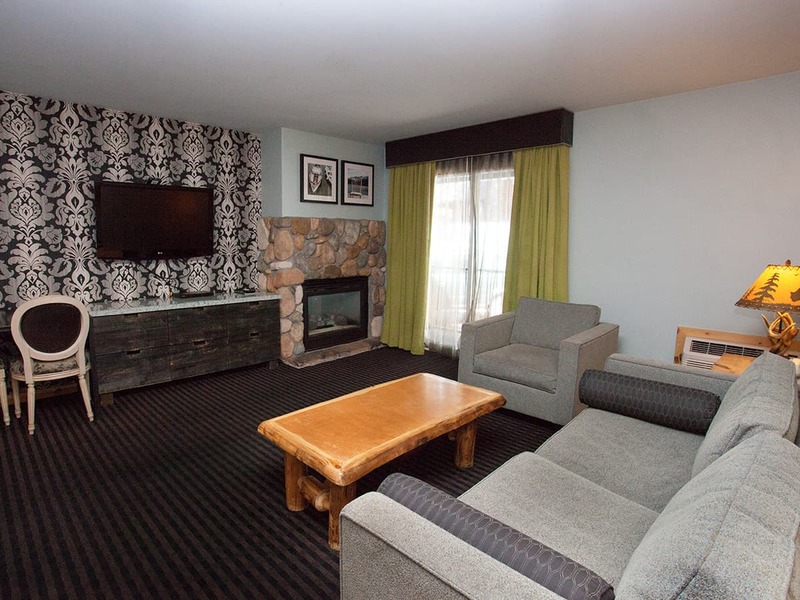 Our suites are non-smoking and combine the comforts of home with the superior service and amenities of a luxury hotel, providing one of the top Tahoe lodging options. So whether you're planning a family vacation or a romantic getaway, come stay at the 3 Peaks Resort & Beach Club Lake Tahoe lodging, where our staff of professionals will make your trip to Lake Tahoe one you'll never forget. Our superb Lake Tahoe resort offers comfort, affordability and a prime location that makes it easy to get to all of the great activities on your vacation. This spacious one bedroom suite includes all the comforts of home combined with remarkable amenities and hotel services. 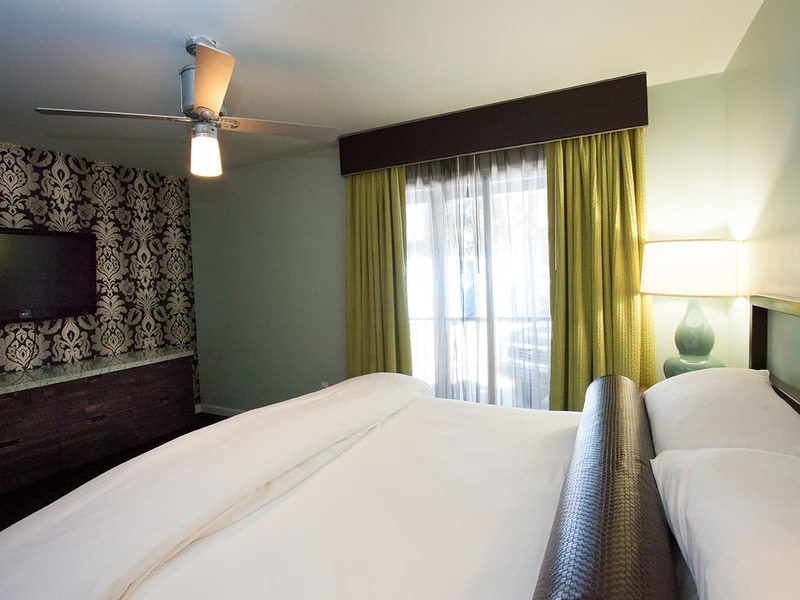 You'll have the luxury of relaxing in a comfortable king bed. When its time to win "cook of the year" you can give it your all in the full kitchen. You'll find everything you need from a toaster to an stove-top oven and microwave to an incredible blender. A cozy living room with a romantic fireplace offers the ideal locale to cuddle up with your sweetheart and pop in a DVD. Additional amenities include an alarm clock, CD player, sofa bed and telephone. Our hotel in Lake Tahoe is the type of place that you have been dreaming of for years. Join us at the 3 Peaks Resort & Beach Club, and experience the Lake Tahoe vacation of a lifetime. Our lavish Poolside Suite is natural and organic mountain materials meet the very best of urban design. 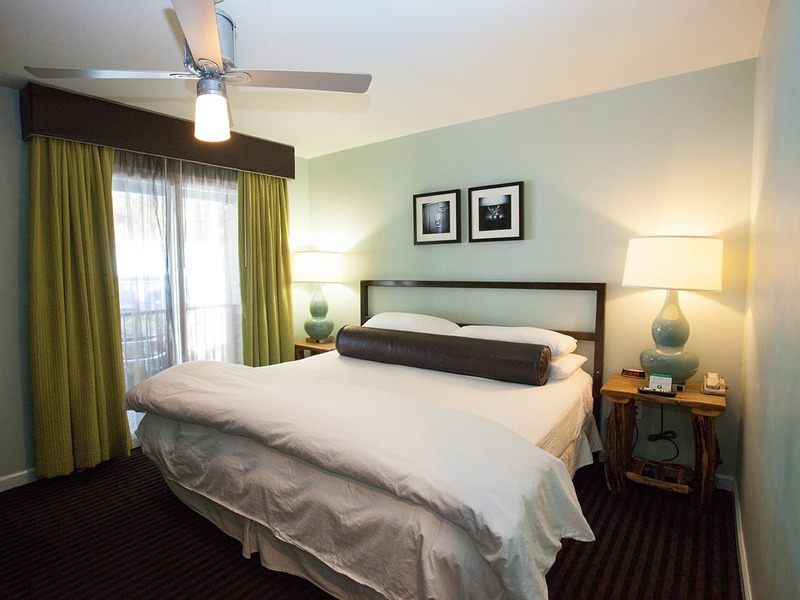 Your room comes complete with high quality linens, pillow top mattresses, granite shower surrounds, whirlpool tub, flat screen LCD TV, A/C, ceiling fan, and private patio with pool access. These rooms are for the adventurous spirit, all Poolside suites are located on main pool patio. Our Lake Tahoe resort has accommodations for people that don't need a bunch of room, but still looking for a certain level of comfort and luxury. Take advantage of one of the Deluxe Studio Suites. No views of the parking lot here as each of the suites are located up a flight of stairs on the Southern end of the hotel. That means you are going to be treated to views of the Lake Tahoe Mountains and the scent of Sierra Pines. Take a step out on your own private deck and take a deep breath, let the clean fresh mountain air waft through your nostrils and lungs. The vaulted ceiling and wood burning fireplace gives each suite that rustic feel which is great for cozying up on cold nights. Speaking of cozying up on a cold night, what could be better than laying on a king size bed, all tucked under the blankets with a loved one, the fireplace roaring away and your favorite romantic movie playing on the DVD/CD player. Want romance? Why not try breakfast in bed. Plug your laptop into the wireless Internet connection and get a few pancake recipes. 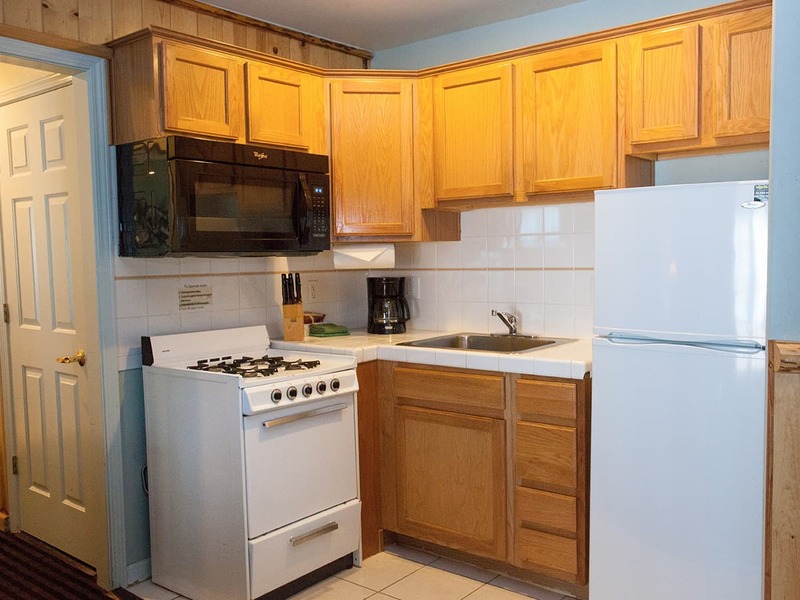 The suite comes with a full kitchen including a full size fridge so you are going to have pretty much everything you need to make it a success. You will be delighted by all of the amenities at our great resort in Lake Tahoe. 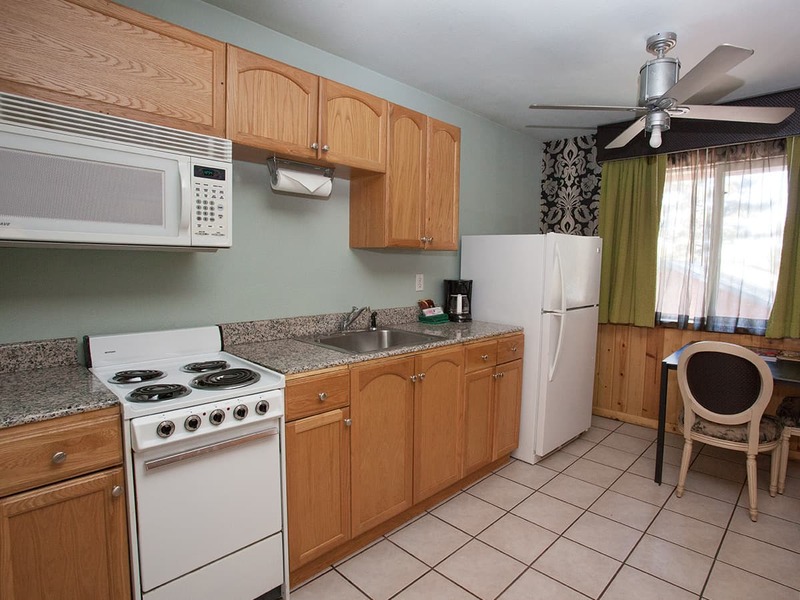 Offering a queen bed and a pool view, this room also features a microwave and a fridge. Tea and coffee-making facilities are included. This Lake Tahoe resort offers you the ultimate when it comes to a cabin in the woods type of feel. There are only three of these suites on the property so you may want to book early. Like any good cabin, the living area features a wood burning fireplace that gives that rustic, down home feel. It also features a full size entertainment center that comes with a DVD/CD player for you to watch your favorite movies or rock out to your favorite CD. Seeing as how the rooms are located on the south side you may want to take advantage of the view. Take a stroll out onto the deck from either one of the bedrooms. The South Lake Tahoe Mountains and pine trees are something you have got to see to believe. Anybody staying in the master bedroom will feel like they are in the lap of luxury. The room features a king size bed which is perfect for really stretching out as well as a TV for those that like to fall asleep to their favorite late night talk show. The second bedroom is nothing to sneeze at. It has got a queen size bed and another TV. Of course each room comes with its own private telephone in case you want to call home as well as alarm clocks so you don't over sleep. For those that need additional sleeping space, the living room features a fold out sofa sleeper. 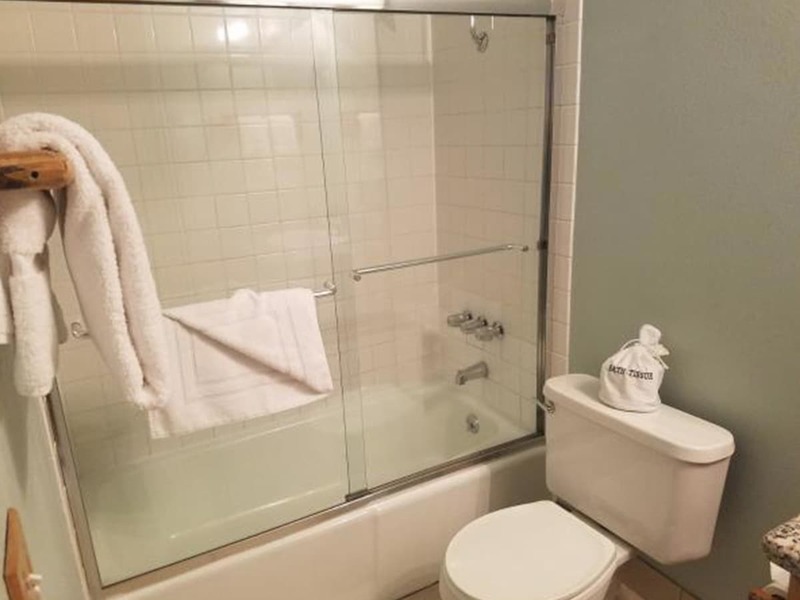 Sure, there might only be one bathroom, but it comes with a shower/tub combo so you have the option of soaking in a nice bubbly bath or just hopping in and out for a quick shower. The kitchen is a great addition for those that believe breakfast is a great start to the day. Whether its scrambling up some eggs on the stove, popping some toast in the toaster, microwaving last night's leftovers and just blending up a smoothie, the kitchen has everything you need. Of course nobody could function without their morning cup of java so the coffeemaker has turned into a lifesaver. It even has an oven for those that are looking to make dinner at home. You will find that with our great location, service and amenities we are one of the best resorts in Lake Tahoe. 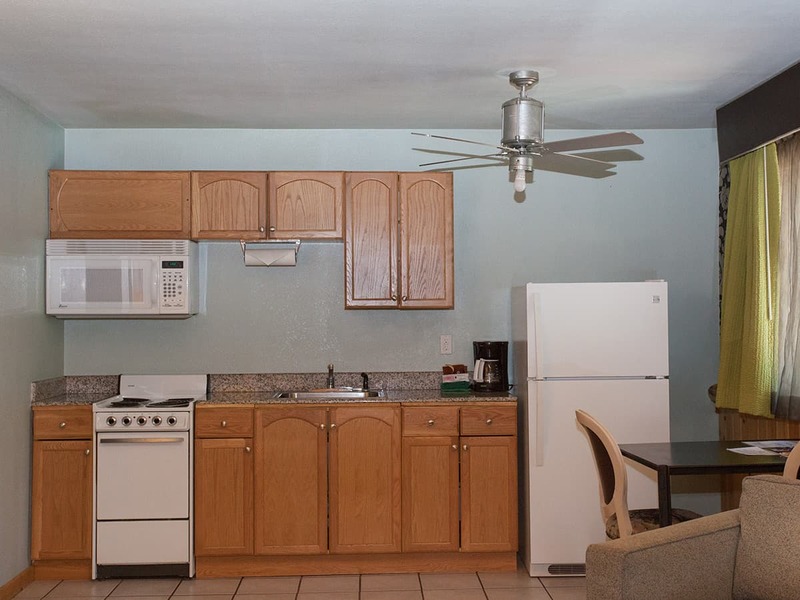 Our lovely South Lake Tahoe lodging options include one and two bedroom deluxe suites with a full kitchen and provide a stove and oven, refrigerator, microwave, blender, toaster and coffee maker. Our living rooms feature a sofa bed, TV, CD player, VCR, telephone and all come with a either a gas or wood burning fireplace. Depending on the 3 Peaks Lake Tahoe lodging option of your choice, your suite will provide a king and or queen sized bed, television and an alarm clock so you don't have to pack one. 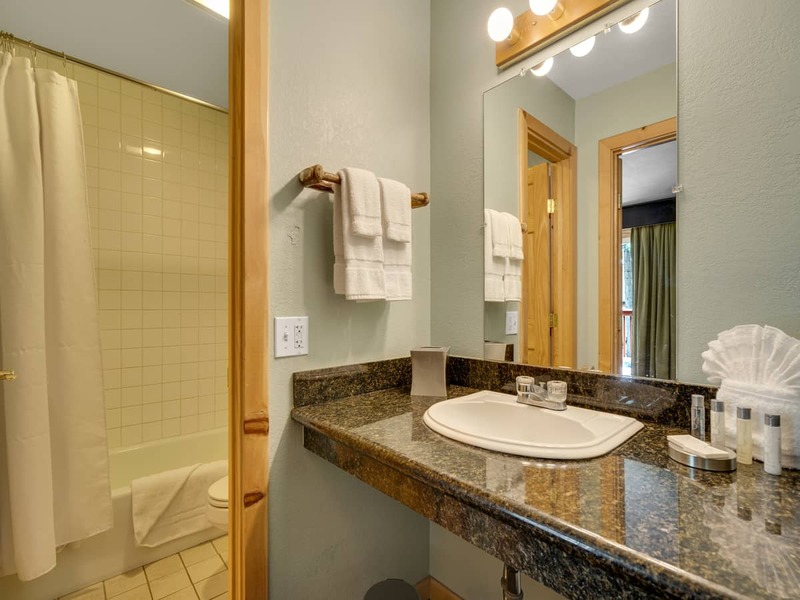 Our large full baths vary on the type of suite you choose, some have a shower - tub combo, while others offer a separate shower and soaking tub for two, and a deck with a beautiful view of the pine trees. 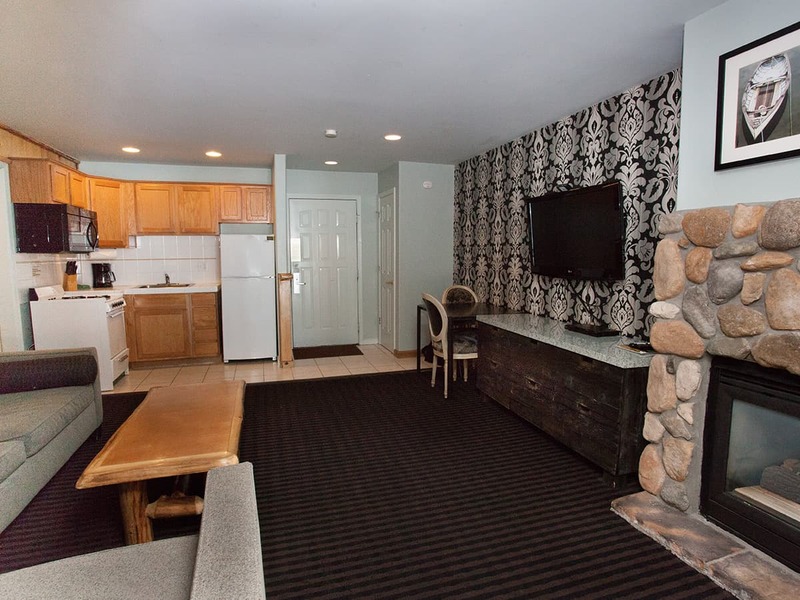 Our 3 Peaks Resort Tahoe lodging options are fit for all types of guests! 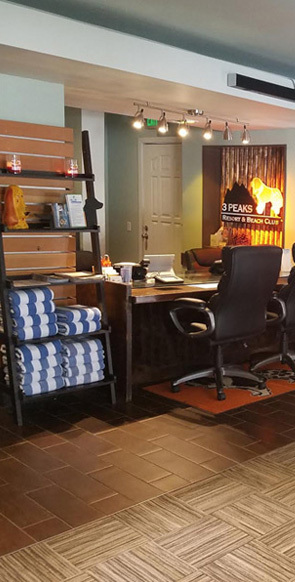 Besides the outstanding in-suite amenities, guests of 3 Peaks Resort Tahoe lodging are treated to premier location for Lake Tahoe activities year-round. 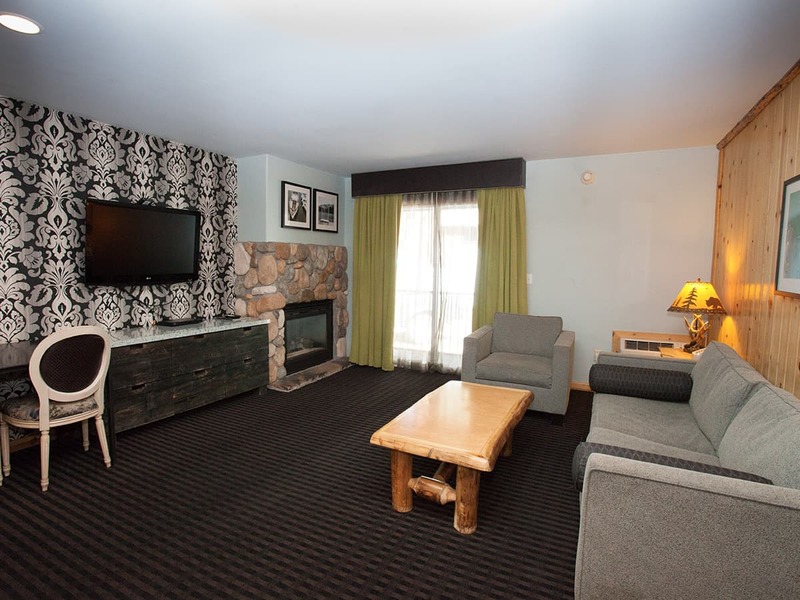 Winter-time guests will appreciate the convenience of 3 Peaks Lake Tahoe lodging, near some of the best snowboard and ski resorts in the Sierra Mountains. In the warm months, choose 3 Peaks Tahoe lodging just two blocks from a private beach on the South Lake Tahoe shore. Reserve your cabin style suite today and find out why so many people agree that 3 Peaks Resort & Beach Club's the best South Lake Tahoe lodging for their mountain vacation stay.